Ralph Sazio played for the Hamilton Tiger-Cats from 1950 to 1953. In 1950 he was elected to the Eastern All-Star Team as a tackle. 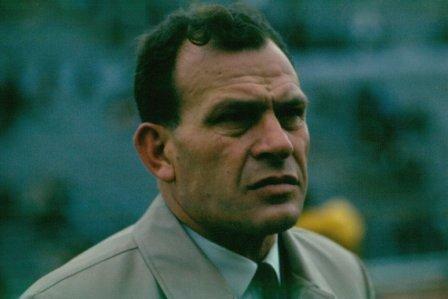 In 1963 he became head coach for the team. Sazio led the Tiger-Cats to 49 wins, 20 losses and 1 tie, for a 70.7 winning percentage. Sazio became the team’s General Manager in 1968, and in 1970 was named President of the Eastern Conference of the Canadian Football League. In 1973 he became president of the Tiger-Cats, and remained with the club until 1981 when he left to join the Toronto Argonauts’ organization. By 1983, the previously struggling Argonauts had won their first Grey Cup since 1952.